The first quarter of 2013 defied many prognostications as growth tracked faster than most had expected. We noted in our outlook report that the sanguine Q4 GDP number would most likely produce a bounce back effect as we transitioned from uncertainty to an “identifiable risk” environment. However, in the face of ongoing concerns and the prospects of national austerity measures, this year surged at a rate faster than many anticipated. National output measures and employment reports buoyed hopes of a strengthening economy. Although Q1 GDP posted at 2.5%, below revised estimates of 3%. We should not forget we were not even close to 2.5% as the year began. As steady as the data was, the vast majority of reports after March 20th and into April began to express a different tone than the recent trend. ISM Manufacturing took a dive to 51 from a previous 55, followed by other regional output gauges with similar declines. The Chicago Purchasing Managers Index reported its first reading under 50 since late 2009. Non-farm payrolls for March played out the recent move higher in weekly jobless claims. The aggregated job adds, including previous month revisions, was in the 150k area. Job creation was consistent with totals over the past 6-9 months but not in the ballpark of expectations after February’s 236K report. Given the surrounding environment, it’s excusable to have held off on buying into this market given its recent history to disappoint at this time of the year. In reality, the most rational way to view the current period is we are still in a low growth range and experiencing a temporary patch of weakness. We simply got a little excited in Q1. With that being said, there are some dichotomies in the financial markets right now that may foreshadow deeper rooted issues. Around mid-February, when the financial markets experienced their first bout of volatility of 2013, a divergence among international and U.S. markets seemed to appear. 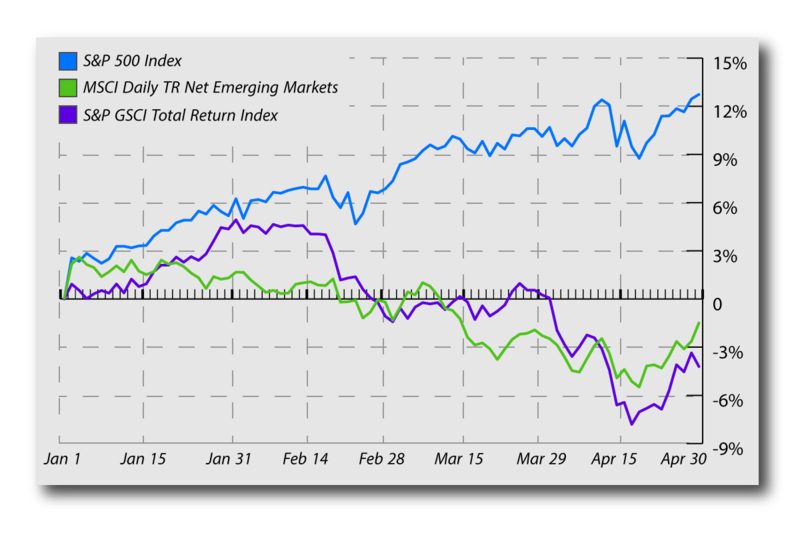 As you can see in the chart below, international equities are well behind domestic equities this year with emerging markets actually down for the year. The renewed stress on the European financial system and a weak recovery has put pressure on those markets. Commodity prices have fallen, led by base metals, as concerns about China’s growth have risen. The above factors pressured commodity producing nations and hampered returns for emerging markets. Everyone is focused on when the Fed will exit its QE program as the economy moves forward. Maybe Mr. Bernanke was placating us by alluding to the exit, knowing full well the economy is not ready. Either way, recent economic reports have us moderately concerned about growth again. 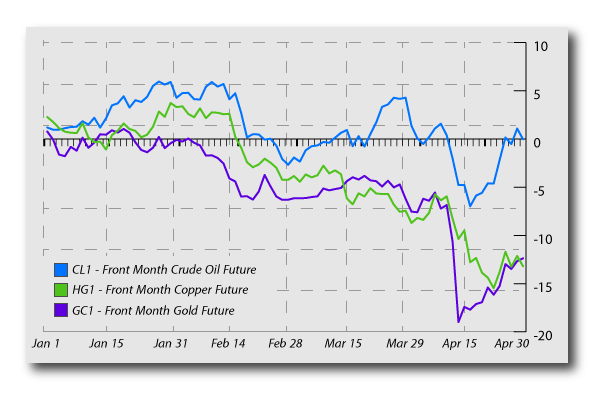 So the question is why are all of these economically sensitive commodities (gold, copper, oil) seeing price declines if the global economy is evolving into a self-sustained expansion? Are rates signaling something as seen by 10 Year yield staying pressed below 2%?? Against the back drop of surging stock prices, this is curious. Combined with the recent announcement from the Bank of Japan on their U.S. look-alike QE program and it makes the interest rate AND precious metals price movement even more surprising on the surface. Throw in the continued weakness in Europe and a considerably benign inflation picture and you have a recipe for continued stimuli, not less. The currency base has increased substantially, specifically MZM, or Money with Zero Maturity. 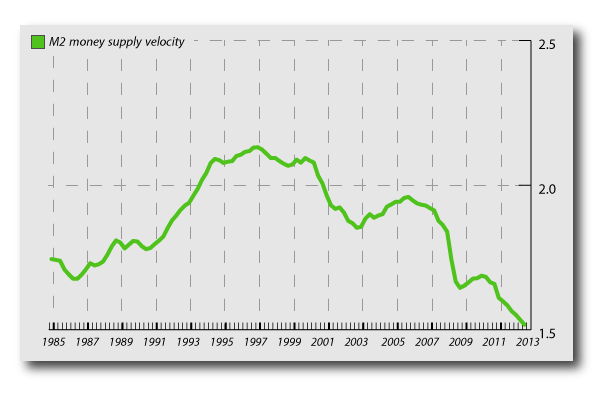 However, if you look at velocity of money chart (shown by M2), you can see the rate of decline has been consistent for almost 5 years now. We are not creating the Fed induced monetary bubble that many think. Money is just not out there chasing goods, the definition of monetary inflation. Consumers have been deleveraging for the last five years, banks are not lending a great deal and corporations are still reluctant to release the purse strings on capital investments with their record levels of cash. Commodity prices have been fading all year, another indication of slack end demand. To be sure about this sentiment, we also looked at other price and demand related gauges for further indication. Recent trends in PPI, CPI and Import Prices have all moved to multi-year lows and in some case post-recession lows. The Personal Consumption and Expenditure Core and Deflator indexes reported at month end also posted their weakest year-over-year readings post-recession. Lower commodity prices/input costs are helping keep cost down for producers, but the aggregate demand curve is proving a bit inelastic in the current environment. What we’ve learned in recent weeks is the Fed is most likely to maintain its programs to support the economy. Recent FOMC minutes detailed that the Fed is willing to move that lever wither way as needed. With the labor market recovery pausing last month, their peg to the UE rate seems to support continuation for now. Recent national output reports from ISM Manufacturing and Chicago PMI, which measured a sub-50 reading for the first time since 2009, are supporting this recent soft patch. While concern may be building over the eventual exit of QE, recent data had provided support for at least the maintenance of the program for the near term. 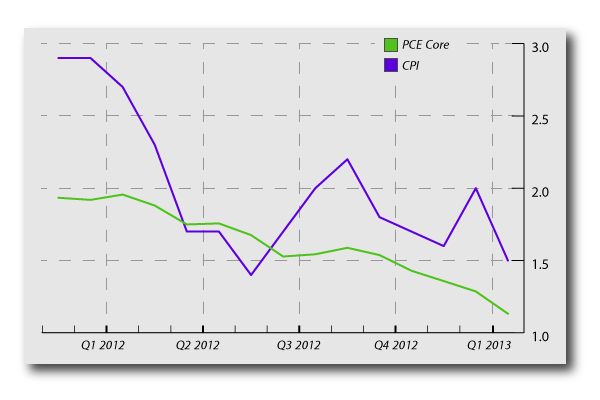 The domestic inflation readings are confounding Fed policy. There is one way to look at this. Supply is currently outstripping demand and global growth is below expectations. Import price, PCE deflator, CPI, et al, have all been declining. This movement supports the Fed and other central banks in their continued supportive monetary stances, but it means the excess liquidity is only solving one half of the equation. It is not sparking a demand recovery, yet. Broad markets in the U.S. have posted strong gains to start 2013. While the U.S. has fiscal issues to navigate, the European environment is much more unpleasant. A great credit shock seems less likely now as preparation and awareness is the antidote for surprise, but the recovery appears arduous and uneven. Logistics in the U.S., while not ideal, are more manageable at this point and the corporate sector is in good shape. Thus far, Q1 top line revenue growth and guidance have disappointed on the balance: a potentially ominous sign. The economy has impressed early this year with its “plow along, steady as she goes” pace. However, more recent data has been less encouraging. If the current shift turns out to be a new pattern, we would become concerned and reduce exposure. The lack of inflationary pressures in the market and economy are of some concern as they could be signaling a weakening demand picture or even a worst case scenario of a deflationary spiral if growth cannot pick up. The first half of 2013 was supposed to be on the weaker side. The second half of this year was supposed to be where we got back on track for good, remember? We may have gotten further ahead of ourselves recently, with our perspective suffering by default. Remember we have some non-standard issues in type and magnitude we are still reconciling, and they may take time. We are not of the camp that the trend is back down at this point, but the length and breadth of the soft patch is expanding. This deserves our attention and some thought to risk. Lastly, as stated in our outlook report, we do not expect this to be the year the bond bubble (if there is even a bubble) bursts. Rates appear to be a bit jumpy but range bound. The persistent strong demand for fixed income assets is keeping a lid on rates. The transparency of the Fed has created a great environment for our Active Income strategy, which is a component of most of our other portfolios as well. This entry was posted in Bryan Novak, Senior Managing Director, Commentary, Home. Bookmark the permalink.